A series of concrete blocks with a difference are appearing on the waterfront overlooking Plymouth Sound. 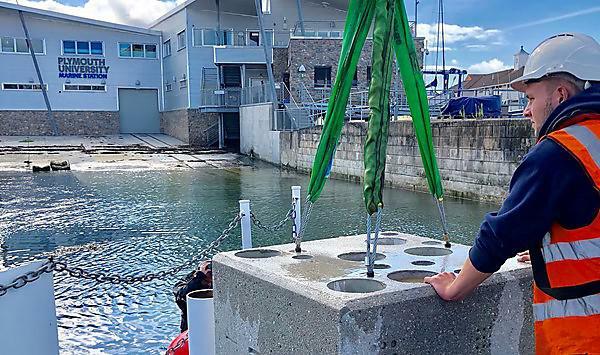 Five BIOBLOCKs have been deployed on the coastline at Teats Hill, close to the University of Plymouth’s Marine Station and the National Marine Aquarium (NMA). Constructed by Brixham-based ARC Marine, they are designed to raise awareness of the potential benefits of artificial reefs in the marine environment. Researchers at the University are involved in a number of schemes using designs different to the standard smooth concrete normally used in coastal infrastructure as a means of improving biodiversity along our coastline. Now they are working with the NMA, ARC Marine and Plymouth City Council to incorporate some of those measures into the wider regeneration of the Teats Hill foreshore. The BIOBLOCKs, funded by the Marine Institute thanks to Higher Education Innovation Funding (HEIF), are now in situ on the Teats Hill foreshore. Each measuring a cubic metre and weighing around 2.4 tonnes, they feature a range of holes and depressions designed to replicate a rocky intertidal area. Normally, they would replace boulders in groynes, breakwaters and other rock armour structures, but have been specifically positioned by the slipways at Teats Hill so they can be observed by the public. To coincide with the installation, a temporary exhibition - also funded by the Marine Institute - has now been opened in the National Marine Aquarium. It features a scaled down version of the blocks and information on how artificial reefs could potentially work. The exhibition will also feature ARC Marine’s interlocking modular Reef Cubes, a newly patented invention being developed in the University's COAST Laboratory thanks to support from Marine-i, part-funded by the European Regional Development Fund. The proliferation of artificial structures in the marine environment is a global environmental problem, as humans are replacing natural habitats with hard artificial structures that are typically poor for marine life. The University of Plymouth is proud to be a partner on Marine-i, designed to help the marine technology sector in Cornwall and the Isles of Scilly grow through research, development and innovation. Over the next 20 years, marine technology will be transformed as a new wave of innovation allows us to exploit the full potential of our oceans in ways that were previously not possible. Bringing these new technologies to market will demand new ways of thinking and Marine-i will be pivotal in ensuring new levels of collaboration across different scientific and technical disciplines. Marine-i is part funded up to £6.8 million from the England European Regional Development Fund (ERDF) as part of the European Structural and Investment Funds (ESIF) Growth Programme 2014-20. The Department for Communities and Local Government is the Managing Authority for ERDF.